Chevy Chase is an American comedian, actor, and writer. His career began as a writer and actor for The National Lampoon Radio Hour, but he is probably best known for being one of the original cast members of Saturday Night Live, and for his portrayal of Clark Griswold in the National Lampoon's Vacation movies. He has been nominated a number of times for the Emmy Award, including two wins, and a Golden Globe. Chevy Chase is a direct descendant of at least three passengers on the Mayflower, John Howland, John Tilley, and William Brewster. He also has a kinship to Mayflower passenger Richard More, and to John Winthrop, Governor of the Massachusetts Bay Colony. His presidential kin include Millard Fillmore, Zachary Taylor, Ulysses S. Grant, Franklin Roosevelt, John Quincy Adams, and several others. He also has a couple of distant connections to the current royal family through Princess Diana and Catherine Middleton. 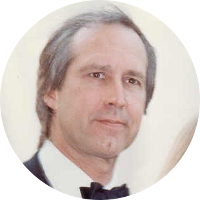 Fellow celebrities that are included among Chevy Chase's kin include Anthony Perkins, Humphrey Bogart, Katharine Hepburn, Elizabeth Montgomery, Alec Baldwin, Ted Danson, Bing Crosby and numerous others. Literary kin include Clarence Day, Ernest Hemingway, Thomas Pynchon, Ralph Waldo Emerson, Louis Auchincloss, John Steinbeck, and Ray Bradbury. David Jewett Baker was the 3rd great-grandfather of Chevy Chase. In 1830, he was an Illinois lawyer and judge who became a U.S. Senator from Illinois when a vacancy appeared due to the death of Senator John McLean. David J. Baker served as a Senator for only a month when he was replaced after an election was held in which he did not run as a candidate. What makes David Jewett Baker noteworthy was his stance on slavery in Illinois. Although Illinois is generally considered a non-slave state, slavery was tolerated in the state until the Illinois Constitution of 1848 specifically forbid it. It has been said that David J. Baker's opposition to slavery in Illinois was so aggressive that his life was frequently threatened.